Novelty Socks or “Crazy socks”are back in fashion and trending world wide! If you haven’t seen people wearing these fun novelty socks on social media or while out and about then you must be living under a rock. Fun novelty socks have made a comeback in fashion just in time for Crazy Socks Day. Now you can buy one of a kind designer Crazy Socks in support of the Crazy for Walking initiative. Buy your Crazy Socks, or be creative and design your own Crazy Socks. 10 October is World Mental Health Day. Do something “crazy” like wearing novelty socks to work to show your support for mental health. Crazy for Walking aims to break the stigma associated with the word “crazy” and mental illness. Lets talk about mental illness. You are NOT “crazy” if you suffer from a mental illness. What is “crazy” … walking from Pretoria to Cape Town is Crazy! 10th October is World Mental Health Day. Mental Health is an increasingly important issue in today’s world and yet there is a stigma placed on those who seek treatment and help. The Crazy for Walking campaign is raising awareness of Mental Health and taking the sting out of the word: “CRAZY”. 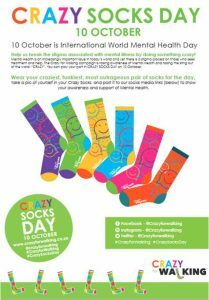 You can play your part in CRAZY SOCKS DAY on 10 October. Wear your craziest, funkiest, most outrageous pair of socks for the day, take a pic of yourself in your Crazy Socks, and post it to our social media links (below) to show your awareness and support of Mental Health. Download a Crazy Socks Day poster below and join in the fun.